Defense contractor General Dynamics envisions one five-story building nestled into a wooded area off Sunset Hills Road in Reston for its new headquarters. It’s a complex with a small footprint, an unobtrusive security fence and on-site amenities for about 200 employees. However, it is not the plans themselves that worry nearby residents and workers — it’s the added stress to Sunset Hills Road, which is two lanes in most spots and is already often a traffic jam during rush hour. General Dynamics announced last week it intends to build a 190,000-square-foot headquarters on a 22-acre lot currently owned by Boston Properties. The project would have 300 parking spaces, most of them in a below-ground garage. 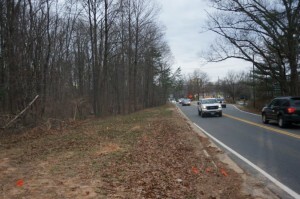 The site is at 11011 Sunset Hills, between Wiehle Avenue and Hunter Mill Road and bordered on one edge by the W&OD Trail. There would be a guard house, but it would be set back into the property in an effort to avoid backups onto Sunset Hills at rush hour, said land use attorney Mark Looney, who is representing General Dynamics. Looney said General Dynamics, which currently has about 1,000 employees in Fair Lakes and about 200 in Fairview Park (Falls Church), looked at many sites around the DC area before picking the Reston land. The site was approved by Fairfax County in 1999 for nearly 358,000 square feet of space spread over three buildings, as well as nearly 1,200 parking spaces, said Looney. The current footprint is much smaller, but does allow for a 30,000-square-foot-addition to the building in the future. General Dynamics intends to keep many of the trees and plans to plant more during the construction process to build a natural privacy shield and sound barrier, said Looney. He also said that there would be no public access to the site from the W&OD for security reasons. The unobtrusive plans were fairly well received by citizens at the meeting. Their main concern was the potential traffic. Looney said General Dynamics is not obligated to make traffic improvements, but may eventually give money to the Virginia Department of Transportation for road widening. The property rights include a 1 1/2 acre swath along Sunset Hills that can be used for an additional lane. Two traffic impact studies are in the works and should be finished in the next few weeks, said Hunter Mill Supervisor Cathy Hudgins. Eventually, those findings may have an impact on road improvements. Looney said General Dynamics has also surveyed employees to see how many would plan on taking Metro to Wiehle-Reston East (nearby, but not necessarily walking distance) and boarding a shuttle. That was good news to a resident of Equestrian Park, the residential development that has its main entrance on Sunset Hills Road, across from the General Dynamics site. Looney said several changes will probably be made to the site plan before final approval by the Fairfax County Board of Supervisors. The plans need to go through Fairfax County Planning & Zoning, the county planning commission and the board of supervisors. He said he expects that to take most of 2016. Construction would take place in 2017 and 2018. General Dynamics’ Fairview Park lease ends at the end of 2018, at which point it would move into the new building.